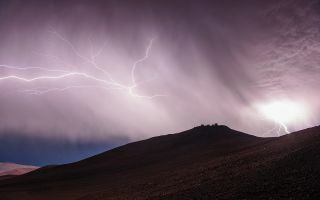 In this electrifying space wallpaper, taken on Friday June 7, 2013, a furious thunderstorm is discharging its mighty rage over Cerro Paranal. In this electrifying space wallpaper, taken on Friday June 7, 2013, a furious thunderstorm is discharging its mighty rage over Cerro Paranal. The colossal enclosures of the four VLT Unit Telescopes, each one the size of an eight-story building, are dwarfed under the hammering of the powerful storm. In the left of the image, a solitary star has emerged to witness the show — a single point of light against an obscured sky. This star is Procyon, a bright binary star in the constellation of Canis Minor (The Lesser Dog). This image was released June 17, 2013.